The contract was awarded by Madrid City Council to UTE RM2 for a period of four years, with an option for an additional two years. UTE RM2 is a consortium made up of Spain’s largest environmental services companies: Valoriza Servicios Medioambientales, Acciona, OHL and Ascan. The new waste collection contract employs 750 people and serves a population of 1,164,212. 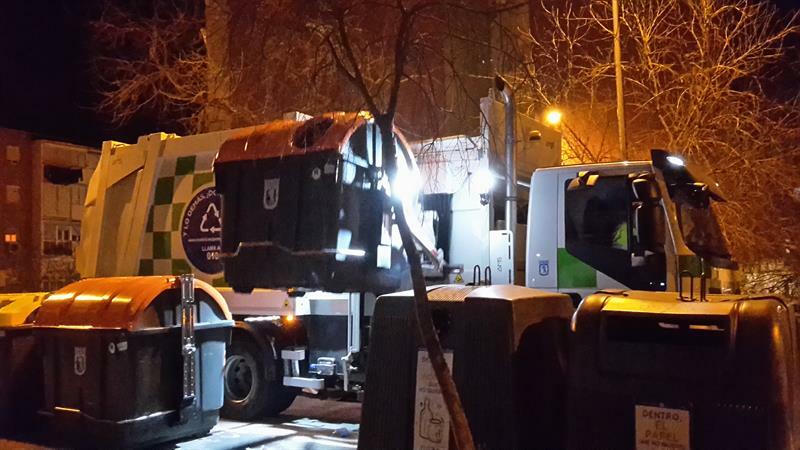 The service is operated 24 hours a day, seven days a week and 365 days a year to collect the 400,000 tonnes of waste produced by people living in the eastern part of Madrid City. The service is provided through three collection shifts: morning, afternoon and night. To provide an efficient waste collection service, UTE RM2 have introduced the side loader waste collection system. Seventeen AMS side loaders have been purchased from Geesinknorba Spain in two capacities: six AMS (CL1-N 22) units of 22m3 capacity and eleven AMS (CL1-N 25) units of 25m3 capacity. The units are mounted onto Iveco Stralis AD260S27.YPS AUT.RSU compressed natural gas (CNG) powered 270 horsepower (HP) 6x2 rear steer 26 tonne chassis. To reduce driver fatigue, each chassis has been fitted with the Allison 3500R Series six speed automatic transmission complete with retarder. UTE RM2 have purchased more than 3000 side loading containers for the new contract in two capacities; 2400 for the collection of organic waste and recyclable packaging and 3200 litre containers for the placement of the residual waste fraction. The lids of each container are identified by colour: brown for organic, yellow for recyclable packaging and orange coloured lid with grey container for residual waste. More than 50% of the new containers have been adapted for use by disabled people such as a foot bar to open the container’s lid for depositing the waste. The introduction of the side loader waste collection system has helped UTE RM2 reduce external operating costs. This has allowed UTE RM2 increase the quality of the service and offer new services to the council. The Geesinknoba AMS side loaders only need to be operated by a driver. The operatives from the previous service, who emptied the 800 litre four wheeled containers using the former rear loading system, have been redeployed within the department to collect biowaste as well as door to door paper, cardboard and glass recyclables from commercial premises. GIS/GPS systems have been fitted in the new vehicles which provide geographic information twenty four hours a day showing the vehicles’ position on the waste collection routes. RFID aerials have also been fitted on the new vehicles’ to read the tags on the side loader containers providing details of the time the container has been emptied. This works by each container’s tag having a unique identification code (ID). The reporting of damaged containers is also recorded through the RFID system. The use of this software helps UTE RM2 improve the efficiency of the waste collection routes and, where damaged containers have been reported, speeds up replacement. The data is also sent to Madrid City Council to show them in real time that all of the containers have been emptied in UTE RM2’S collection zone. The AMS side loaders deliver packaging wastes and residual waste twenty four hours a day, seven days a week to the Valdemingomez waste treatment plant. This facility is owned by Madrid City Council and processes all of the city’s packaging and residual waste. There are three separate waste treatment plants in the Valedmingomez complex. Waste collection vehicles deliver waste to a specific waste treatment plant dependent on the zone of the city in which they have been working.